You need special ski bags to protect your skiing equipment when travelling, whether by car or plane. This article explores what to have in mind when buying ski luggage. Your skis must fit in the ski bag so the first thing to do is to measure your skis. You may find the measurements at the top of your skis or snowboard. 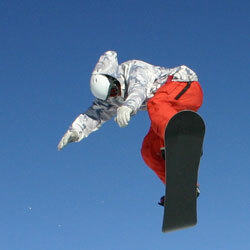 Ski equipment bags are either made of soft or hard case and there are different pros and cons to each type. 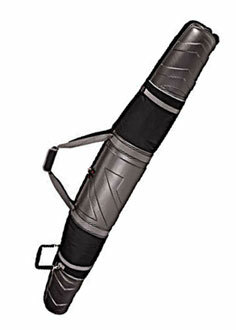 Soft case ski bags are more flexible and as such are easier to maneuver in tight spaces, e.g. to fit into a car trunk. They offer more storage space for other belongings, as easier to stuff them than hard ski equipment bags. Soft bags tend to be cheaper than hard-sided ski cases though you can expect to pay similar price for the top quality ski bags. The most expensive soft bags have molded plastic ends and middle for increased protection. Fully padded soft bags are well suitable for air travel though some airlines accept no liability unless you are travelling with hard case ski bag. 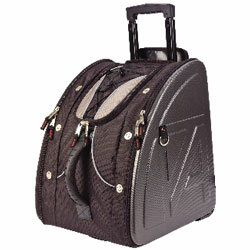 Hard case ski bags provide the best protection for you ski equipments. Hard ski bag is therefore ideal for those that fly frequently with their skiing gear. Quality hard ski bag will last you a long time. On the other hand, they are heavier than their soft case counterparts are so you might want your hard ski bag to have wheels. Hard cases also offer limited storage space (you can't stuff them) and they are rigid, making them less than ideal when space is restricted, e.g. when travelling by car. You want your ski bag to be as lightweight as possible. This is particularly important if you cannot wheel your ski bag. Soft bags are commonly between 3 - 10 lbs (1.4 - 4.5 kg) and hard cases between 7 - 14 lbs (3.2 – 6.4 kg). Quality zipper is important, as zippers tend to be one of the weakest links where all luggage is concerned. Coil zippers are strong and flexible and commonly used for tents... making them the perfect zipper for ski bags as well. Ideally, your ski luggage has TSA approved locks. It allows US airport security staff to open your ski bag without damaging the lock or your bag. Some ski equipment bags have large external pockets that can hold your ski boots and other ski gear, so called combo ski bags. Many skiers however prefer to use separate ski boot bag. If you are one of them look for boot bag that can fit in the overhead compartment of an airplane. Ski boot bags are usually big enough to hold helmet, goggles, gloves and skiing outerwear as well as the ski boots. This means boot bags can be heavy, making wheeled ski boot bag a good idea. Most skiers bring daypack on their skiing vacation. It should be big enough for the personal belongings you need for a day on the slope, e.g. refreshments, sun protection, extra clothing layers, etc. Some skiers use special winter hydration pack to keep them hydrated while on the slopes. Always check the luggage warranty when buying ski bags. Good ski luggage is an investment that should last you for a long time. Quality manufacturers offer warranty on their products, some even up to limited lifetime warranty.